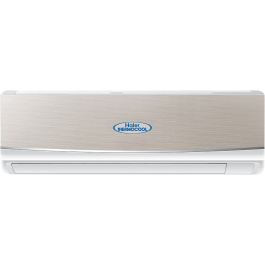 The Haier Thermocool Supercool Luxury Split Air Conditioner HSU-09SLG1 (1HP) is everything one could want in an AC. It cools down rooms quickly and in a wide range of voltage conditions. Importantly, you can be guaranteed that it will last thanks to its sturdy copper frame! Copper Strong: This AC is made of 100% Copper. What this means is that if you own one of these, you’re owning an easily maintained AC built to last with reliable strength and good heat transfer. Low Voltage Operation: Our Low Voltage Operation is designed to work with voltages as low as 170V making it perfect for the Nigerian power situation. It allows you to enjoy our superb cooling performance even when power is erratic and without the use of a stabilizer.